The painting, which years ago was in the Peloso collection in Verona and later in a private collection in Parma, has attracted the interest of scholars multiple times over the years. 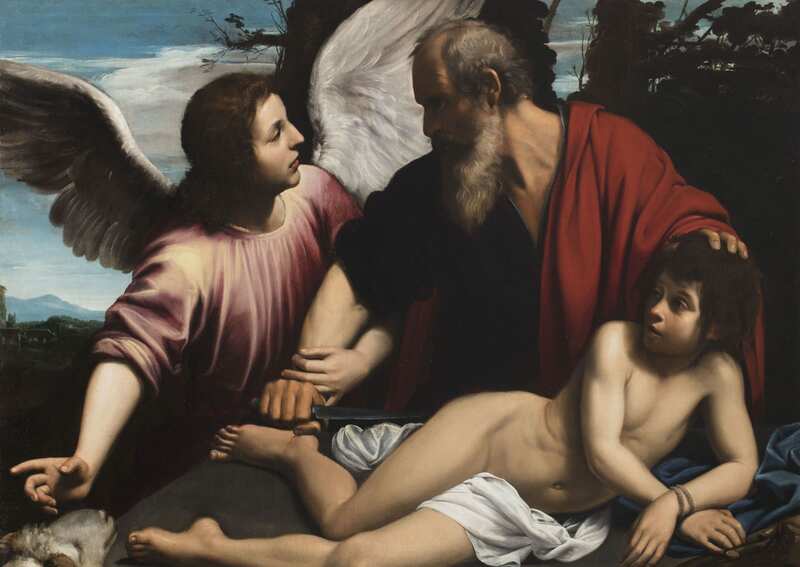 The painting was first discussed in Alberto Crispo’s detailed studies of 1966, with the expertise of Giuseppe Fiocco in favour of Caravaggio, and its attribution only confirmed to Vermiglio in 1975 by G. Gregoretti. B. Nicolson, The International Caravaggesque Movement, Oxford, 1979, p. 37. F. Bologna, Tre note caravaggesche, in ‘Prospettiva’, 33-36, 1983-1984, pp. 202-211. M. Gregori, Il Sacrificio di Isacco: un inedito e considerazioni su una fase savoldesca del Caravaggio, in ‘Artibus et Historiae’, 20, 1989, pp. 140-141. F. Frangi, Giuseppe Vermiglio tra Caravaggio e Federico Borromeo, in Studi di storia dell’arte in onore di Mina Gregori, Cinisello Balsamo, 1994, pp. 161-169. A. Mazza, La Collezione dei dipinti antichi della Cassa di Risparmio di Cesena, Bologna, 1991, pp. 112-119. M. Pulini, A Giuseppe Vermiglio, pittore del ritorno, in ‘Paradigma’, 11, 1996, pp. 49-58. A. Crispo, Giuseppe Vermiglio da Roma a Milano: il problema dei modelli, in ‘Artes’, 7, 1999, pp. 80-82, 99. D. Pescarmona (ed. ), exh. cat. Giuseppe Vermiglio: Un pittore caravaggesco tra Roma e la Lombardia, Campione d’Italia, Galleria Civica, 10 September – 3 December 2000, fig. 23 (illus. ), p. 45. M.C. Terzaghi, Giuseppe Vermiglio, in I Caravaggeschi, a cura di A. Zuccari, Milano, 2010, pp. 751-763. G. Papi, Entro l’aria bruna d’una camera rinchiusa, Napoli, 2016, pp. 190-201. Crispo later referred to the painting as the work of Carlo Saraceni, while Benedict Nicolson in 1979 defined it merely as Caravaggesque. In a brief article in the early eighties Ferdinando Bologna advanced the name of Giovanni Baglione (also supported by Carlo Volpe, in an oral communication to the then owner). It was Mina Gregori Gregori, in her article of 1989 dedicated to the Sacrifice of Isaac that the scholar returned to the idea of an attribution to Giuseppe Vermiglio, along with other works, establishing for the first time the physiognomy of the Lombard painter’s oeuvre, among them the version of the painting that in 1989 was at the Galleria Marcello Guidi in Florence. In 1991, Angelo Mazza did not share the opinion of Gregori, or acknowledge a stylistic synchronicity with Vermiglio, however, by 1994 Francesco Frangi relaunched Gregori’s attribution to Vermiglio, confirming the hand of the Milanese painter. Later, the attribution to Vermiglio was completely accepted: it was reiterated by Massimo Pulini in 1996, by Alberto Crispo in 1999 (for the present work) and by Alessandro Morandotti for the monographic exhibition on the artist of 2000. Frangi, in line with Gregori's view on the Rapp version of the subject, also placed the present version in Vermiglio’s Roman period, a stay that ended between Easter of 1619 (when he was still registered in the parish of San Lorenzo in Lucina) and 27 April 1621, when he married Violante Zerbi in Milan. This is also my opinion on stylistic grounds, as the painting shows clear parallels with the Roman Caravaggesque environment. As recently stated, Vermiglio had to be in contact with important collectors of the works of Caravaggio, as he singularly popularised his themes, and not merely as a copyist. In fact, he interpreted them, remaining faithful to their essence, while changing structural details and models. The Sacrifice of Isaac was a particularly re-worked theme by Vermiglio, recalling both the Barberini painting by Caravaggio today in the Uffizi, and the ex-Johnson version that several scholars attributed to Caravaggio in the past, (but which has now been recognized as a masterpiece by Bartolomeo Cavarozzi, probably executed around 1615). In particular, the present work shows the compositional debt of this last prototype. In my recent monograph on Cavarozzi, I put forward the hypothesis that the Viterbo painter could be considered in the middle of the second decade as a sort of revival of Caravaggio, and would not be surprised that his works closely linked to Caravaggio’s iconography could be evaluated on that basis. The ex-Peloso painting here in question, stands out from the other versions of Vermiglio because of its notable stylistic proximity to Cavarozzi’s style, which is expressed in the brightness of the brushstrokes. The mellow consistency of Isaac's clear skin and the dense red of the mantle on Abraham's shoulders are particularly beautiful; while in the figure of the angel and drapery of his robe the clear hand of Vermiglio emerges. Precisely for these reasons, I believe that this painting is among Vermiglio’s most significant works, from his important Roman phase. M. Pulini, A Giuseppe Vermiglio, pittore del ritorno, in ‘Paradigma’, 11, 1996, pp. 49-58; A. Crispo, op. cit., 1999, pp. 80-82, 99; A. Morandotti, Gli anni romani di Giuseppe Vermiglio, in Giuseppe Vermiglio. Un pittore caravaggesco tra Roma e la Lombardia, catalogo della mostra (Campione d’Italia) a cura di D. Pescarmona, Milano, 2000, pp. 41-56. M.C. Terzaghi, Giuseppe Vermiglio, in I Caravaggeschi, a cura di A. Zuccari, Milano, 2010, pp. 751-763; G. Papi, La Giuditta che decapita Oloferne di Giuseppe Vermiglio. Una prova di fedeltà caravaggesca, in G. Papi, Entro l’aria bruna d’una camera rinchiusa, Napoli, 2016, pp. 190-201. G. Papi, Bartolomeo Cavarozzi, Soncino (CR), 2015.